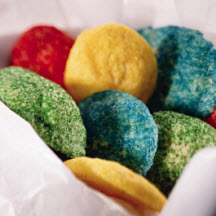 These sparkling, colorful cookies offer the traditional holiday flavor of eggnog. Combine flour, baking powder and nutmeg; set aside. Cream butter and granulated sugar at medium speed of electric mixer. Add egg yolks; beat until fluffy. Blend in eggnog. Add flour mixture, mixing until thoroughly combined. Refrigerate 2 hours or until firm. Combine decorating sugar and cinnamon. Roll dough into 3/4 inch balls; roll in colored sugar mixture to coat. Place 2 inches apart on lightly greased cookie sheet. Bake in a preheated oven at 400°F (205°C) for 8 to 10 minute or until set.